Bacon! Bacon! Bacon!The beauty of this dish is that you can pretty much eat it any time of day. Whether it’s breakfast for dinner or dinner for breakfast, it’s just…really good. 1. Fry bacon until crispy. Remove from pan and drain on paper towels. Chop into bits and set aside. 2. Using the same pan, remove some of the bacon grease (if necessary) so you have about 3 tbsp left in the pan. Add the onions and sauté until translucent. Add the garlic and sauté for a minute longer. 3. 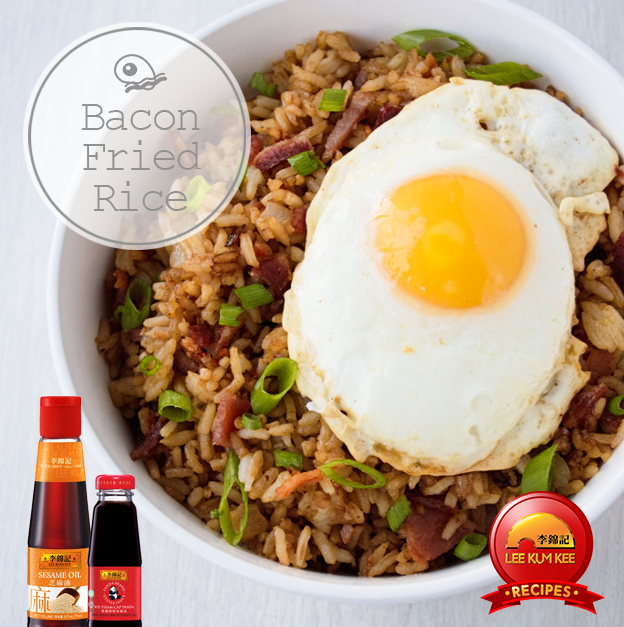 Then add the bacon, rice, Lee Kum Kee Soy Sauce, Panda Brand Oyster Sauce and black pepper. Stir-fry for 3-5 minutes. Taste for seasoning and adjust as necessary. 4. Drizzle with sesame oil, top with fried egg and scallions. Enjoy!